Now that AMC has aired the fourth-season premiere of The Walking Dead (“30 Days Without an Accident”), it was only a matter of time before ScreenJunkies released an Honest Trailer for the hit zombie TV show. Usually, ScreenJunkies reserve their Honest Trailer treatment for movies, but considering the wide popularity of The Walking Dead, it seems fitting that they poke fun at why people still watch this show. Why do people watch The Walking Dead week after week? Do people watch the series because of its characters or the blood and gore? The only consistent thing about The Walking Dead is just how inconsistent the show can be. It seems like every season starts off strongly, but after the mid-season finale it just whimpers to the finish line. Did I mention that Scott Gimple is the third showrunner on The Walking Dead in four seasons? Well, he is. One of the reasons why The Walking Dead fluctuates in quality so much is that its characters aren’t well established. They make mind-boggling bad decisions again and again without any rhyme or reason. It seems like they make decisions based on the plot and not as an extension of the character. It’s frustrating. One of the best parts of the Honest Trailer is pointing out that Lori is just the worst. When she was on the show, her character was the least defined and she got into stupid situation after stupid situation. There was actually a sigh of relief from viewers when the writers killed off her character. She brought nothing interesting to the series, only sheer annoyance. “Shane Rubbing His Head” is a really good pick up. You never notice a character’s personal ticks until you put them all in a supercut. Even when he shaved his head in season two, Shane continued to rub his head a lot. Also, pointing out that Glen is dating way out of his league is just brilliant! In the meantime, while the season premiere for season four was not as action-packed as previous premieres, it did introduce an interesting dynamic that will play heavily throughout the season. The poster above features Violet the pig, which died in this past episode, as a newly resurrected zombie. 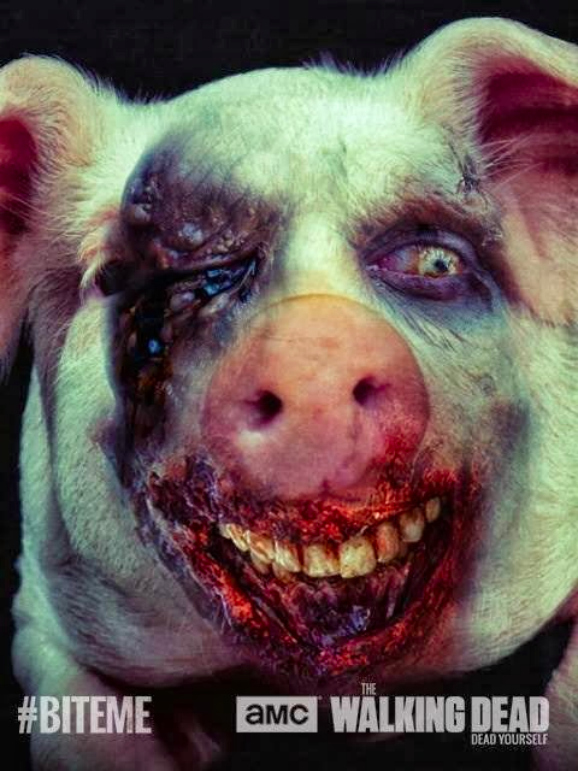 If animals can now get infected, no one is safe from the zombie threat. Is the zombie virus in the bloodstream or the drinking water? It seems that the small piece of real estate Rick and his group found at the prison will soon come to an end, as the whole world is destined to be turned into zombies. It now appears as if surviving is more important than living. There is no hope for The Walking Dead, and it seems that it has just gotten bleaker. The Walking Dead will air the episode “Infected” on Sunday, October 20th on AMC.